Dubai’s real estate market is steadily gaining strength and popularity amongst people worldwide. Although property transactions slowed down after the emirate doubled property transaction fee in 2014, but that just separated property flippers from genuine buyers with the fore being effectively curbed from the market during the course of the year. The market is now conducting a commendable number of property transactions with investment values continuously increasing every quarter. After recording AED 55 billion in the first quarter, total real estate transactions in Dubai touched AED 113 billion in H1 2016. The figure was derived through a total of 28,251 sales, mortgages and other transactions with property sales and mortgages accounting for 20,000 sales and 6391 sales, respectively. The figures were revealed by Dubai Land Department (DLD) who further reported that property sales and mortgages individually contributed 43 percent of the total investment amounting to AED 48.715 billion and AED 48.366 billion, in that order. The remaining 1,844 transactions totalled AED 16 billion. Per details, land sale transactions reached AED 27 billion through 4,753 transactions, whereas land mortgages registered 2,377 transactions fetching AED 42.751 billion. 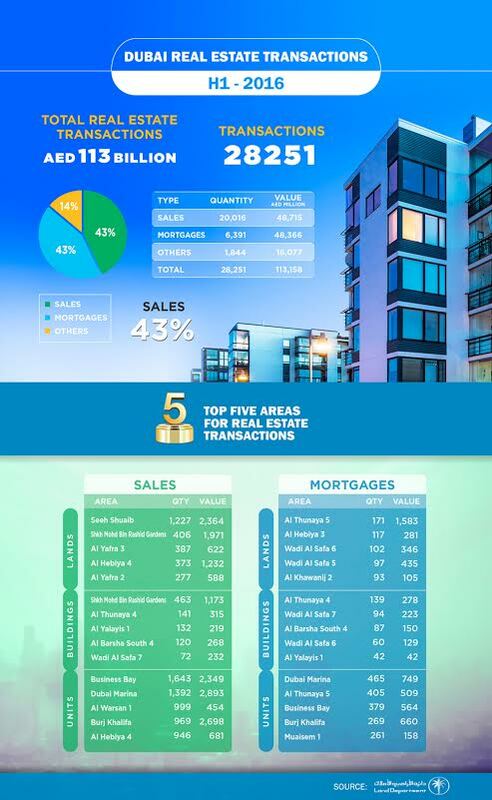 Other transactions amounted 422 were valued at AED 14.399 billion. DLD revealed that 20,699 transactions were related to buildings and units, where buildings accounted for 1,125 transactions worth AED 3 billion. Property transactions related to units fetched AED 24 billion from 19,033 deals. The mortgage transactions weren’t as many and only 488 transactions were completed for buildings while unit mortgage deals numbered 3,526. Considering localities, Business Bay secured the top place regarding unit sales after conducting 1,643 transactions worth AED 2.349 billion. The locality bordering Dubai Water Canal was followed by emirate’s most popular residential locality Dubai Marina with 1,392 transactions valuing AED 2.893 billion. The third place was secured by Warsan 1 and the locality conducted 999 transactions worth AED 454 million. For further details, consider the following infographic by DLD.